"Crazy good! You have got to have a reading with her! She's incredible!" "Crazy good! A super star! You have got to have a reading with her! She's incredible!" until Jan 20th From June 21st: $375 - payment plans available as needed. The workshop will take place in an artists' home on a lake in Clarkston, GA 30021. 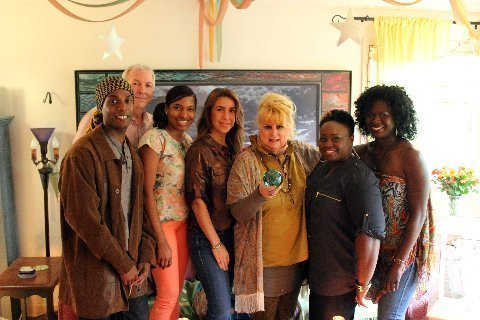 Taught by Cathy H. Burroughs, Internationally Noted Psychic as featured on The Real Housewives of Atlanta, Kim Zolciak's 40th Birthday Party as filmed by BRAVO for Don't Be Tardy, the recipient of more than 1,000 calls following her appearance on Q-100's The Bert Show and elsewhere. Special Guest Appearances: From Philadelphia Mystic Sally Kingman Harvey, Galactic Healer Debra A. Loshbough, Facebook Sensation Eylissa Henry + cool Psychic Asia (aka Kandi Ladi) and more. 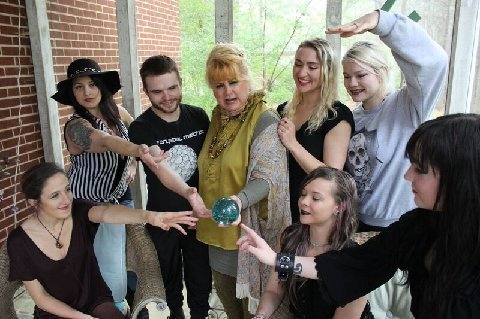 Renowned psychic crime solver Ginette Lucas is the daughter of the illustrious dowser Louis Matacia who worked with the FBI, CIA, DIA and others. Ginette helped break the Casey Anthony and Chandra Levy cases. Her specialties are locating missing objects, treasure and missing persons. To Register: Cell/text: (404) 543-1080 Email: Cathyb108@aol.com. Please plan on staying as schedule allows for Saturday eve readings. Payments accepted through Paypal via Friends and Family. Sally will be offering in-depth Soul Contract Analysis for workshop participants for $225 following the workshop if you wish to submit your order. These take Sally 4-6 hours of preparation and are profound. In this weekend intensive, we will cover a wide range of topics with many interactive exercises and opportunities to provide practical means of developing one's natural intuitive and psychic gifts. We will learn how to read past, present, future; how to scan energy and the body and access your guides and angels. We may use psychometry (working with objects); guided meditation; automatic writing and clearing the aura and chakras; managing the energies with protection and grounding; working with reading and moving energy; your spirit guides; shamanic journeys; past lives; opening the third eye; pendulum/muscle testing (tools of validation) towards developing clairvoyance, audience and sentience; channeling; mediumship; visualization; manifestation; working with the lunar cycles and more. In some cases we may explore reading a variety of additional unique modalities such as lip reading, handwriting analysis, tea leaves, scrying, and more. We'll also explore ways of working with the tarot and astrology to develop psychic ability and understand how each member of the class accesses their intuitive gifts. I will be opening up and sharing my psychic tool box taught to me by my guides, angels and honed through more than 20 years as a professional psychic. We will practice readings as well as remote viewing; learn to read past, present and future and how to access intuitive clues from your surroundings. We will explore a wide range of different means of receiving information and validating the accuracy of that information. There will be practice readings with each other, one on one and in the group, as well. You may see your intuitive powers and your life take an exponential leap! This workshop is a spiritual retreat that allows you and propels you to become more in tuned with your authentic self, your true purpose, your path and your guides as well as honing your ability to see intuitive clues and signs that promote your destiny! Please note: the workshop content may vary contingent on number of class participants, etc..
We'll also explore ways of working with the tarot and astrology to develop psychic ability and understand how each member of the class accesses their intuitive gifts; sharing my psychic tool box taught to me by my guides; practice readings; remote viewing; reading past, present and future. We will explore a wide range of different means of receiving information and validating the accuracy of that information. There will be practice readings with each other, one on one and in the group, as well. Each workshop participant that takes the entire weekend will be provided with a 30 min complimentary psychic coaching session with Cathy or a mini astrology update. You may see your intuitive powers and your life take an exponential leap!! Treat yourself. Change your life! *The workshop is located at 1089 Cleavemark Drive, Clarkston, GA 30021. As heard on Q-100's The Bert Show + The Kimmer Shows and featured on AIB TV! World of Coca Cola, Chateau Elan, and corporate and private parties all over town - and nationwide! Special showcase options for NYC. About Cathy's teaching: Great class yesterday!!! Despite that pesky Mercury Retrograde, you were on fire. I really learned a lot. Love the class members...all very engaged and insightful. I appreciate all that you do and give to us; you are a gift. - IT Director, World Food Organization. For full course description go to www.psychicsolutions.tv or call/text: (404) 543-1080.
email: cathyb108@aol.com. To book a session, class, special event or for questions, call (404) 292-2000 or (404) 543-1080. **Please order Parker's Astrology as a reference book. You can generally find it very affordably on Half.com, Amazon or Ebay. The workshop will be at held in Clarkston, GA 30021 (between Stone Mountain and Decatur). If you are interested, please email: cathyb108@aol.com, FB, or call (404) 543-1080. THANK YOU FOR TONIGHT'S CLASS! YOUR TEACHING RULES!!! YOU are a FABULOUS TEACHER! I learned an incredible amount from you this evening, Cathy. I look very forward to coming to YOUR teaching classes!!! You are very thorough, respectful, knowledgeable, wise, playful, funny...one of the best teachers I have ever been a student of. I understand myself and the world about 1000 times better! and has a great ability to convey that knowledge to us. and many other concepts of astrology. I highly recommend her classes to beginners, intermediates or advanced students of astrology!